The zBitco faucet is a an interesting Bitcoin faucet where you chose when and how much coins to claim – once you open the faucet your balance will gradually start to increase until you decide to claim it. The longer you wait, your balance will get be bigger. Some users prefer to claim every day once, or every hour, some claim every week, It’s really up to you to decide when and where are you going to claim. The minimum time for a claim however is 5 minutes and the maximum can be up to a month. For 5 minutes you can collect 20 satoshi, but waiting a full day to claim your prize will land you 860 satoshi and if you wait a month you’ll be getting 2152 satoshi. The best thing is that you don’t need to keep a track of time with the faucet, whenever you visit it after your first visit will get you coins and the longer between visits, the more you will get. 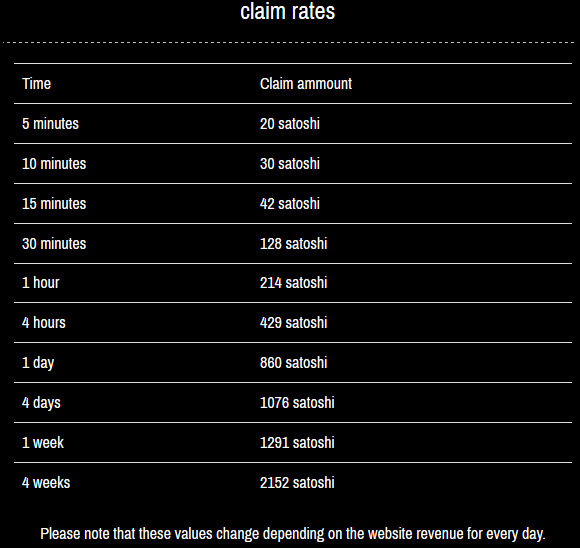 You are paid automatically every Sunday if your account reaches at least 5500 satoshi. The Bitcoin address used to sign in is used for payment, so before joining please double check that you have typed your Bitcoin address correctly. There is also an affiliate program available that allows you to earn 30% lifetime commission on all faucet claims from people you refer to the faucet. Of course they are going to get their full payout and each time they request a dispense from the faucet and you will be getting extra 30% bonus of the amount they claim.